Why is CRM essential for Sales Managers? Is it possible for a business company to become successful without changes? The answer is definitely no. Success demands continuous hard work and improvement throughout the entire company, especially in the sales department. Some companies think they will benefit from the constant expansion of the sales department team. Unfortunately, increasing sales isn’t always about the number of people involved in it, but it’s definitely about the improvement of the sales team productivity. If you are seeking ways to improve sales management, then CRM software is a perfect solution for you. Let’s take a precise look at the benefits of a CRM system for sales management. First of all, CRM software provides any company with a safe storage space where salespeople can store information about customers’ contacts, sales opportunities and activities having continuous access to the database from multiple locations, so one doesn’t have to worry about data loss. At the same time, it is also an excellent way to optimize daily schedules and prioritize tasks to be sure that customers will be contacted on time. As a result, your sales staff will be supported throughout the whole sales cycle. One of CRM’s tools for reporting and analytics automates preparing weekly and monthly reports. 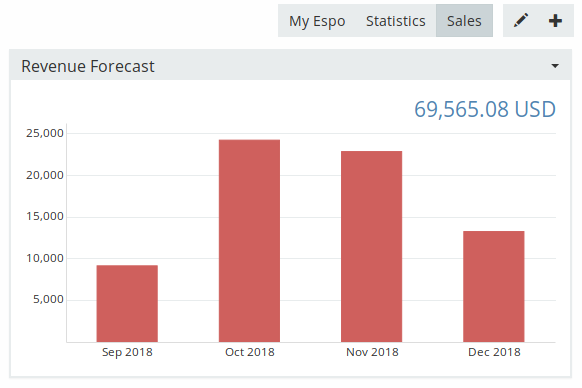 Now it takes only a few clicks to inform others about sales progress that in turn helps to identify the most profitable opportunities, and saves time for more important tasks. Due to shared calendars, CRM streamlines e-mail integration, fosters communication within a company, unites not only team members but also different departments, keeping everybody up-to-date. From a management standpoint, such a centralized database that automatically reflects all the changes in real time may become a key for building long-term customer relationships, improvement of customer service and managing sales successfully. In addition, CRM systems optimize sales department work by creating efficient workflows, which remove and reduce some repetitive actions. It also triggers reminders for calls, appointments, and e-mails that result in the reduction of a great variety of errors connected with sales and orders. As mentioned above, a CRM system and sales department may become the perfect match that will boost sales and bring success to your company. So, stop hesitating and give it a try!